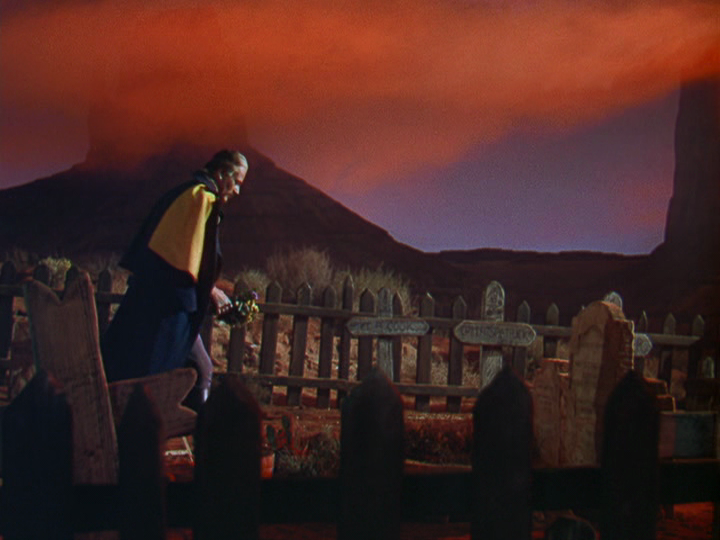 So what actually happens in John Ford’s She Wore a Yellow Ribbon (1949)? A cavalry troop leaves a lonely fort in the Old West, heads towards a destination, returns to the fort, goes back out a second time, comes back again. Everything else that physically “happens” beyond that is just window-dressing. It’s a very curt, very sparse story. There are a few studio-mandated action scenes, the odd cavalryman outracing a group of murderous Native Americans, some sporadic gunfights. There’s even a suspenseful scene where a soldier undergoes a risky surgery to remove a bullet lodged just above his heart while aboard a fleeing covered wagon. 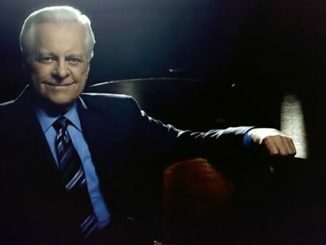 The big climax involves a midnight operation to disarm and scatter the stereotypical horde of vengeful Natives, thereby preventing the kind of final battle scene so beloved by Hollywood filmmakers—Ford included. She Wore a Yellow Ribbon is instead first and foremost about its characters and the military environment they inhabit. It’s a film that lives in the odd moments in-between the cavalry charges, the drawn-out periods of waiting before and after embarking on missions, the idle chit-chat between soldiers and civilians while on the trail. It’s a film effused with the sense of sadness so typical of Ford’s later work, a kind of Americanized “mono no aware,” (“the pathos of things”) as we watch aging officers who’ve outlived their youth and usefulness hand over the reins of command to fresh-faced young bucks. The officers and enlisted men aren’t just soldiers, they’re surrogate fathers and sons. Take US Cavalry Captain Nathan Brittles (John Wayne). Though just six days from retirement, he commands with an easy vigor. He sorts out squabbles among his men almost more like a mother than a father, chastising soldiers who fight over women, who act disrespectfully at funerals, who don’t properly mind their horses while on patrol. His “corrections” are about more than just maintaining military order and decorum, they’re about shaping these sons of his into capable, self-reliant men. The knowledge that he will retire in six days frightens him. He doesn’t know if his boys will be able to stand on their own two feet, or even worse: they will, proving just how unnecessary and unneeded he’s become. The military as family unit was a theme Ford returned to again and again, most explicitly in his under-appreciated masterpiece They Were Expendable (1945) about a doomed, close-knit squadron of PT Boats serving in the Pacific Theater in World War Two. These families are often ruled by stern yet well-meaning paterfamilias officers: James Cagney in What Price Glory? (1952); Tyrone Power in The Long Gray Line (1955); Henry Fonda in Mister Roberts (1955). Oftentimes they operate with an odd familiarity and casualness one wouldn’t expect of polished soldiers. 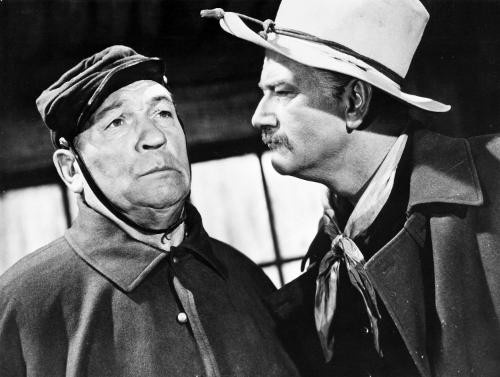 Take one of the greatest moments in “Yellow Ribbon”: Brittles tricks his subordinate officer and old friend Sergeant Quincannon (Victor McLaglen) into trying on a new suit. Knowing he’s a long-time alcoholic (not a serious one, mind you, but the kind of Hollywood alcoholic so beloved by Ford where their drinking is funny and disruptive but never destructive), he tells Quincannon to show it off by going to the fort’s saloon to get a drink. The moment he leaves his office, Brittles orders his men to arrest him for drunkenness and for being out of uniform. Quincannon’s punishment? Locking him in the jail—but only long enough so that he’s out of action for the impending battle against the Native Americans, so Brittles can reach retirement in two weeks in peace and safety. Of course, Quincannon has the size and strength of an ox. Several men try and fail to subdue him while he’s in the saloon, Quincannon knocking them out or throwing them over chairs and tables while calmly pouring out drinks. He stops long enough to invite his arrestors for a toast in honor of Brittles. Afterwards he begins the fight anew, punching them one-by-one down the entrance stairs until the wife of one of his superiors reprimands him for his behavior and escorts him to the jail house. Of course Quincannon is wise to the scheme. But that doesn’t stop him from fighting back. Where would the fun be in going quietly? These interpersonal relationships help make “Yellow Ribbon” palatable despite being one of Ford’s most politically incorrect films, being about the US cavalry triumphantly forcing a group of starving Native Americans back onto their reservations. It opens with a sequence eulogizing General Custer and his “immortal” 7th cavalry regiment wiped out during the Battle of Little Bighorn. There’s a sequence where a group of Native Americans gleefully roast an American to death by throwing him again and again on a roaring campfire and another where a killed ex-Confederate officer is buried with a Confederate flag over his coffin and eulogized as a “Christian Gentleman.” The film doesn’t transcend such problematic material. Nor should we pretend it does. 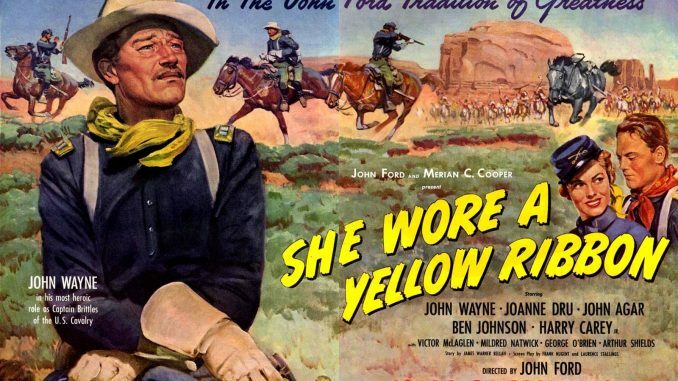 The second entry into Ford’s “Cavalry Trilogy” —the other two including Fort Apache (1948) and Rio Grande (1950)—”Yellow Ribbon” is a minor film in Ford’s Western filmography. But sometimes such minor films give us the greatest glimpses into the minds of their makers. 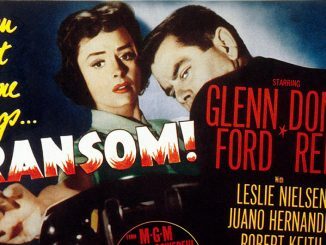 The film boasts one of Ford’s more uncommon storylines and some of his boldest uses of color cinematography. 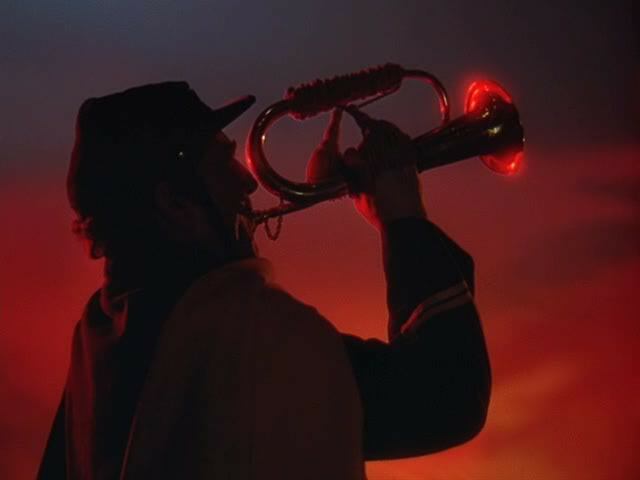 (One sequence where Brittles monologues to his dead wife over her grave features backgrounds effused with bright reds that feel more at home in a Dario Argento film than a 1950s Hollywood Western.) 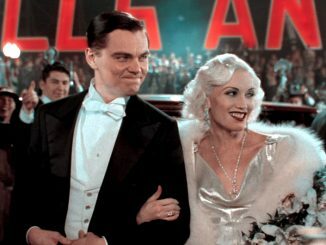 It’s not a masterpiece, but not every film in such a large and substantial canon needs to be. 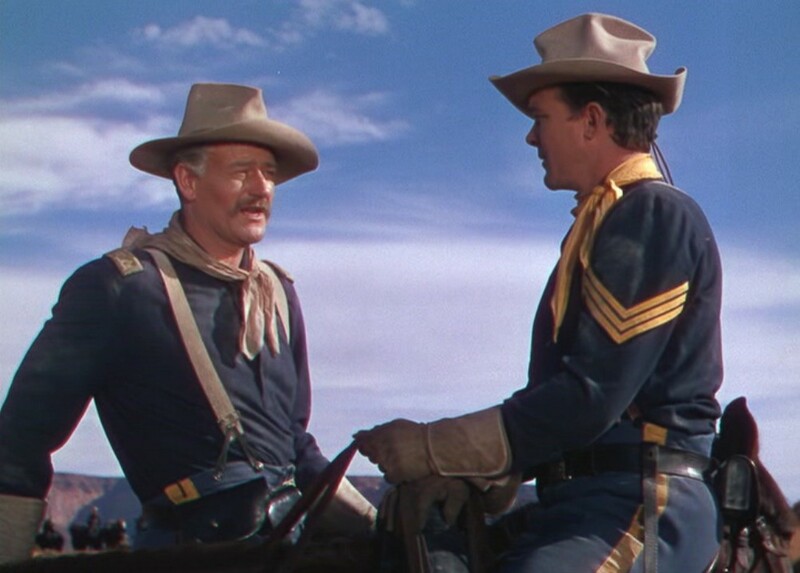 She Wore a Yellow Ribbon was released on Blu-ray by our good friends over at Warner Brothers. The transfer is beautiful, but unfortunately this is one of their more sparse offerings in terms of special features. There are no cartoons or short documentaries, both of which are always two of the best parts of any Warner Bros or Warner Archive Collection release. The edition boasts only a trailer and a collection of “John Ford Home Movies,” in reality about 5 minutes of soundless candid footage of Ford and Wayne location scouting. Thankfully, the movie itself is enough for any film buff or Ford fanatic to want to add to their library.